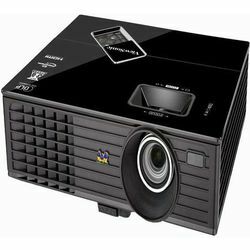 ViewSonics PJD6553w is an advanced networkable, widescreen format, DLP projector equipped with Crestron built-in e-Control and RoomView Express, making it ideal for classroom and corporate environments. In addition, the PJD6553w is AMX certified which further enhances it to be a robust, networkable projector for any size of campus or enterprise. The PJD6553w incorporates BrilliantColor technology to produce more vibrant colors, while 3500 ANSI lumens and 15,000:1 high contrast ratio make this WXGA 1280x800 projector ideal for classrooms or board rooms. With ECOView technology, the presenters can dim the image for control of audience focus while saving up to 70% in energy. LAN connectivity enables remote network management for easy maintenance, while the extensive input options including HDMI and integrated 10W speaker provide amazing mulitimedia performance. ViewSonics PJD6553w is an advanced networkable, widescreen format, DLP projector equipped with Crestron built-in e-Control and RoomView Express, making it ideal for classroom and corporate environments. In addition, the PJD6553w is AMX certified which further enhances it to be a robust, networkable projector for any size of campus or enterprise. The PJD6553w incorporates BrilliantColor technology to produce more vibrant colors, while 3500 ANSI lumens and 15,000:1 high contrast ratio make this WXGA 1280x800 projector ideal for classrooms or board rooms. With ECOView technology, the presenters can dim the image for control of audience focus while saving up to 70% in energy. LAN connectivity enables remote network management for easy maintenance, while the extensive input options including HDMI and integrated 10W speaker provide amazing mulitimedia performance.